Here are a few more pages I have made using the soon to be retiring Big Deal Alphabet. 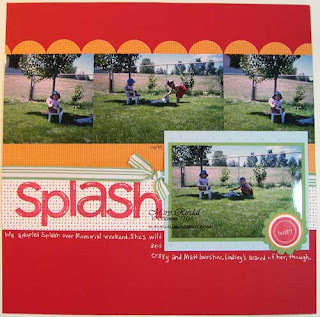 This 'Splash' one is one of my favorites with the bright summer colors and again with the White Gel Pen highlights on the letters. We used to have a dog named 'Splash'. 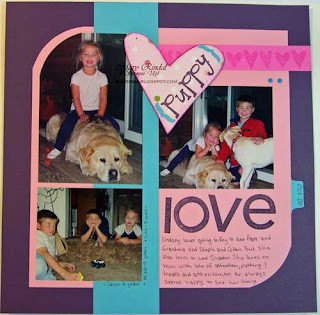 I used lots of chipboard and doodling on this page. The COOL part of the title is stamped in Brocade Blue directly onto the Barely Banana page. Then I used a Basic Black Journaler to doodle around the letters and add a lot of character and definition. This page is such a simple layout, but I just love the photo of my son shivering under a towel, watching the other kids on the slip n slide, with that pensive look on his face. The title is stamped in Whisper White Craft Ink. The corner doodle is from Doodle This, also soon to be retired. Another Big Deal title - I love the mixed alphabets on the title here, as well as the '2 Cool' page above. No highlights or texture added to this one. When I grow up I want to scrapbook like you! Love your pages!